This popular gift plant (Cyclamen persicum) is a native of the Mediterranean and North Africa and they brighten up any room with their elegant, colorful and softly fragrant flowers. 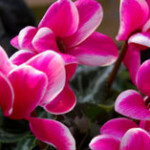 Properly cared for, Payne’s cyclamens can bloom for months on end. Light: Bright, indirect light ― a north or east window is perfect except when the plant is dormant during the summer. At that time it’s best kept out of bright light. 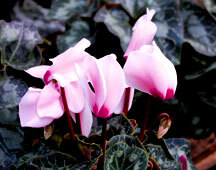 Temperature: Cyclamen do not like heat, but they are not frost hardy. Do not expose to temperatures below 50 degrees F. Avoid drafts as well as hot, dry air. They prefer cool temperatures in the 65-70 degree range. If they get too warm, and they’ll stop blooming and go dormant. Watering: Water thoroughly when the soil surface is dry but before the leaves go limp. It is important to avoid getting water on the crown of the plant which can make it rot. 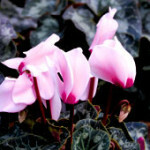 The best way to water cyclamens is from below: sink the pot halfway into a bowl of water and let it soak until water has seeped up to its surface by capillary action. Remove the pot from the water and let any excess moisture drain out of it. If watering the plants from above, aim for the inside edge of the pot. Humidity, especially during winter, is important. 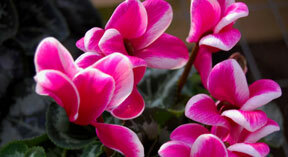 One way is to keep the cyclamen on a tray of water with a layer of pebbles to form a shelf for the pot to sit on. 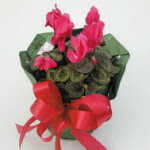 Do not let the cyclamen itself sit in the water. Grooming: Remove dead flowers or leaves by giving the stems a sharp tug. If this doesn’t work, wait a week or so and try again. Tugging too hard can remove chunks of tuber, severely wounding the plant. Nourishment: Fertilize every 2 weeks with a water soluble bloom fertilizer at half strength. Time-release fertilizers are also an option. Ask a Payne’s professional at one of our Garden Centers for details.